Megan over at The Nerdy Girlie took some time to write out blogging confessions last week, and I really enjoyed reading them! She’s started a link-up over at the Female Geek Bloggers community on G+, so I thought I’d take a few minutes today to share my confessions with you. Don’t worry; I have more garments to share with later this week! 1. I am awful at self-promotion. Others have said this, so I’m probably just preaching to the choir. Part of the reason I joined The Monthly Stitch as well as the Female Geek Bloggers was an effort to put myself out more. Sometimes I feel like I’m just another drop in the massive sea of the Internet, but that’s part of the beauty of it, isn’t it? Whether you have 5 followers or 5 million, everyone has a chance to participate in the conversation. As a brief aside, this is why Net Neutrality is so important. 2. Reading sewing blogs is the main reason I decided to create my own wardrobe pieces and participate in the RTW Fasting Challenge. I’ve learned more about crafting from fellow bloggers than anywhere else. 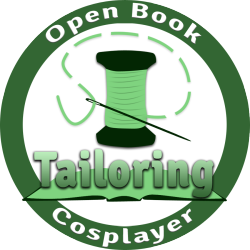 I enjoyed applying those lessons to my cosplay, but the more I looked at others creating pretty garments for themselves, the more I felt compelled to do the same. Fast forward two years, and barely a day goes by when I don’t do a sewing-related something. I learned about indie patterns through sewing blogs as well! 3. Photos are always my biggest struggle with blog posts. I’m not a particularly skilled photographer. Actually, I’m going to take an additional step and admit that my photos are pretty bad. But photos are a big part of my blog posts, so a few months ago, I picked up an inexpensive point and shoot camera and I’ve started playing more with timed shots, lighting, and photo editing. My photos are a lot better than they were a year ago, but I still have a long way to go. Hopefully I’ll have the time to take a photography class soon. 4. Blogging has helped me connect with tons of new friends! I have so many connections now that I’ve met through blogging and social media. It’s crazy to think that some of the people I look to for advice on a regular basis are people I didn’t even know before I started this journey. I love it! But that doesn’t mean that I don’t read other blogs, make the occasional comment, or start drafting a post when I have down time or go on breaks. I try not to do it too often, but sometimes the thought of reading another piece of professional literature makes my head pulse. That’s when I know it’s time to take a blog break! Bonus: I’ve had Usher’s Confessions stuck in my head since I read Megan’s original post. 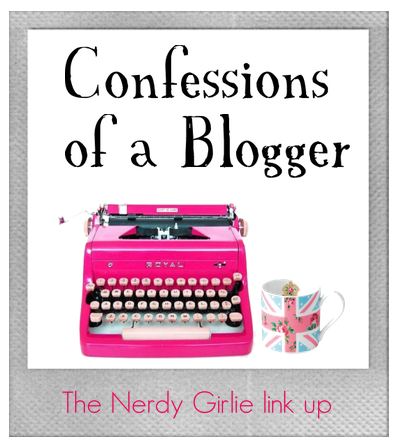 What are some of your blogging confessions? Check out the link-up for more confessions from other bloggers! I’m with you on #3. Plus sometimes it’s hard to find a photo to go along with a post, just to break up the text. Agreed! Since most of my posts are based on my sewing projects, it’s mostly a matter of making the time to take and edit photos. But when I do write on a different topic (like this one), I have the hardest time finding photos! Fortunately, cat memes exist. Mindy…first off…LOL about the Usher song!!! LOL 2nd, my favorite part since beginning my blog has been the friends I have met. It is nice to have people who understand everything fandoms mean to us! Keep up on your photography! I’ve been a photographer since birth it feels like and I am always learning and developing/evolving my style! I love Instagram for inspiration! I hear you on number 3. Although, I think the pics on your blog are not bad! I really like them. But it’s never my top priority and I find it a hassle to take pics, but when I do I am happy with seeing the evolution of my garments. 🙂 Thanks for sharing the confessions! Thanks, Andie! Really, I’m mostly focused on garments as well, but after working with several very talented photographers on cosplay shoots, I just wish my photos had a little more… Or at least, aren’t super grainy. It’s crazy all the new skills you learn with blogging! Hahaha omg now I can’t stop singing Usher’s Confessions song now…lol!! I have also made a lot of friends thanks to blogging, it’s pretty amazing! Haha, right? I’m still singing it now. Blog friends are the best! Great post! And yes it seems that across the board self promotion is on the list. Reading all the posts about this is along with all the encouraging people I’m meeting is helping me with self promotion. I like your photos, but I know what you mean. I’m always looking at mine (especially the ones I have to resort to taking with my phone camera) and think about how much better they could be! A major problem I have is that I tend to do projects at night, so I don’t have any natural light to work with. (Not that that realization has changed anything).